How Much Does 2017 Toyota Camry Insurance Cost? Average insurance rates for a 2017 Toyota Camry are $1,404 a year for full coverage insurance. Comprehensive costs approximately $282, collision costs $566, and liability costs around $398. Buying a liability-only policy costs as low as $460 a year, with high-risk insurance costing around $3,054. Teenage drivers receive the highest rates at $5,272 a year or more. Rate data is compiled from all 50 U.S. states and averaged for all 2017 Toyota Camry models. Rates are based on a 40-year-old male driver, $500 comprehensive and collision deductibles, and a clean driving record. Remaining premium consists of UM/UIM coverage, Medical/PIP, and policy fees. For a 40-year-old driver, prices range go from as low as $460 for a discount liability-only rate to a much higher rate of $3,054 for high-risk insurance. These differences illustrate why anyone shopping for car insurance should compare prices using their specific location and risk profile, instead of using average rates. Being forced to pay for high-priced insurance premiums can bleed your accounts and put a big crunch on your finances. Shopping your coverage around is recommended to reduce premiums and put more money in your pocket. If you have car insurance now, you will be able to save some money using these tips. Choosing the best insurance company for you is easy if you know what you’re doing. But car owners do need to know the way insurance companies sell insurance online. Car insurance is not an enjoyable expense, but there could be significant discounts to help offset the cost. Most are applied when you purchase, but occassionally some discounts must be requested specifically prior to receiving the credit. Save with More Vehicles Insured – Buying coverage for several vehicles with one company qualifies for this discount. Multi-policy Discount – If you have multiple policies and place coverage with the same company they may give you a discount of nearly 15% which can help you find cheaper car insurance. Paperwork-free – Certain car insurance companies will give a small break just for signing your application online. Accident Forgiveness Coverage – but some insurance companies may permit one accident before raising your premiums so long as you haven’t had any claims prior to the accident. Homeowners Savings – Owning a home can earn you a little savings since home ownership is proof of financial responsibility. Early Switch Discount – Some insurance companies give discounts for switching policies prior to your current policy expiration. You can save around 10% with this discount. Good Driver Discounts – Safe drivers can pay as much as 50% less for Camry insurance compared to accident prone drivers. As is typical with insurance, most discounts do not apply to all coverage premiums. Most only reduce individual premiums such as comprehensive or collision. Even though the math looks like you could get a free car insurance policy, it’s just not the way it works. The best car insurance companies and a partial list of their discounts can be found below. State Farm offers discounts for multiple policy, good driver, driver’s education, multiple autos, Drive Safe & Save, Steer Clear safe driver discount, and passive restraint. Farmers Insurance offers premium reductions for teen driver, homeowner, alternative fuel, multi-car, and pay in full. Progressive may include discounts for continuous coverage, multi-vehicle, multi-policy, online quote discount, and homeowner. GEICO may offer discounts for defensive driver, five-year accident-free, anti-lock brakes, good student, and emergency military deployment. Auto-Owners Insurance has savings for safe vehicle, mature driver, paperless, air bags, and anti-lock brakes. The Hartford policyholders can earn discounts including vehicle fuel type, anti-theft, defensive driver, driver training, bundle, air bag, and good student. Farm Bureau has discounts for multi-policy, youthful driver, good student, renewal discount, 55 and retired, safe driver, and multi-vehicle. USAA may have discounts that include annual mileage, loyalty savings, defensive driver, good student, multi-policy, and military installation. If you need affordable car insurance quotes, ask each company or agent which discounts they offer. Some of the discounts discussed earlier may not be available in your area. If you would like to see a list of insurers with discount rates, click here. There are several ways to compare quotes from many auto insurance companies in your state. The recommended way to compare rates is simply to get online rate quotes. It is quite easy and can be accomplished in a couple minutes as outlined below. If you’re in a hurry, the quickest way to get quotes is a comparison rater form click to view form in new window. This type of form eliminates the need for a different quote for each company. One quote request will get you rate comparisons from many national carriers. A more difficult way to obtain and compare quotes online is to manually visit each company’s website to request a price quote. For sake of this example, we’ll assume you want to view quotes from Progressive, Esurance and Liberty Mutual. To do that, you would have to spend time going to each site individually and enter your policy data, which is why the first method is more popular. Whichever way you choose to compare rates, try to keep nearly identical quote information with every price quote. If you compare different values for each quote it’s impossible to make a fair comparison for your Toyota Camry. Just a small difference in coverages may result in a large different in cost. It’s important to know that more quotes increases the change that you will find a lower rate. Some companies don’t provide rate quotes online, so it’s important to compare rates from the smaller companies as well. Lots of factors are taken into consideration when quoting car insurance. Some of the criteria are obvious such as your driving record, but other factors are not as apparent like your continuous coverage or your vehicle rating. Deter vehicle theft – Buying a car with a theft deterrent system can earn a premium discount. Anti-theft devices such as vehicle immobilizer systems, OnStar, and tracking devices like LoJack all help prevent your vehicle from being stolen. Avoid unnecessary extra coverages – There are a lot of extra bells and whistles that you can get tricked into buying on your Camry policy. Coverages for roadside assistance, towing, and extra equipment coverage may not be needed and are just wasting money. These coverages may sound good initially, but if you don’t need them think about removing them and cutting costs. Low credit history equals high rates – A driver’s credit rating is a big factor in your rate calculation. People with very good credit scores tend to be better risks to insure as compared to drivers with lower credit ratings. If your credit can be improved, you could save money insuring your 2017 Toyota Camry by improving your credit score. Five star NHTSA crash test rating saves money – Safer cars tend to have better insurance rates. The safest vehicles help reduce the chance of injuries in an accident and lower injury rates translates into fewer and smaller insurance claims and thus lower rates. If your Toyota Camry scored better than an “acceptable” rating on the Insurance Institute for Highway Safety website you may be receiving a better rate. Higher rates for auto insurance policy lapses – Driving any period of time without insurance is illegal and any future policy may cost more because you let your insurance coverage expire. And not only will insurance be more expensive, getting caught without coverage could result in a license revocation or jail time. Being married can lower rates – Having a significant other may cut your premiums on auto insurance. Having a significant other means you’re more financially stable and insurance companies like that drivers who are married are more cautious. Lower coverage deductibles cost more – Physical damage protection, also called comprehensive and collision insurance, covers your vehicle from damage. A few examples of covered claims could be a windshield shattered by a rock, flood damage, and rolling your vehicle. The deductibles are how much you are required to spend before your auto insurance pays a claim. The more damage repair cost you’re willing to pay, the better rate you will receive for Camry insurance. File a auto insurance claims and pay more – Insurance companies provide the best rates to policyholders who do not file claims often. If you are a frequent claim filer, you can definitely plan on either policy cancellation or increased premiums. Your car insurance is meant to be used in the event of major claims that would cause financial hardship. When choosing adequate coverage for your personal vehicles, there is no single plan that fits everyone. Everyone’s situation is a little different and a cookie cutter policy won’t apply. For example, these questions can help discover if you will benefit from professional help. How high should deductibles be on a 2017 Toyota Camry? If you’re not sure about those questions but one or more may apply to you then you might want to talk to an agent. To find lower rates from a local agent, simply complete this short form or click here for a list of auto insurance companies in your area. What car insurance coverages do you need? Understanding the coverages of car insurance can be of help when determining the best coverages and the correct deductibles and limits. The coverage terms in a policy can be confusing and even agents have difficulty translating policy wording. Shown next are typical coverages offered by car insurance companies. This will pay to fix damage to your Camry resulting from colliding with a stationary object or other vehicle. You will need to pay your deductible then your collision coverage will kick in. Collision insurance covers claims such as driving through your garage door, sideswiping another vehicle and damaging your car on a curb. Paying for collision coverage can be pricey, so you might think about dropping it from vehicles that are 8 years or older. 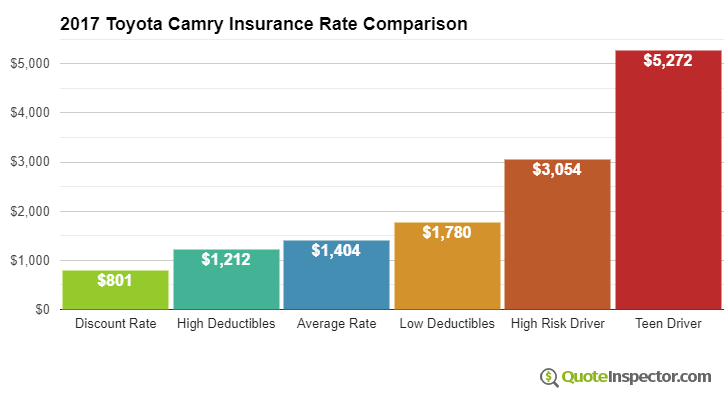 Drivers also have the option to choose a higher deductible to get cheaper collision coverage. This coverage gives you protection when the “other guys” do not carry enough liability coverage. This coverage pays for hospital bills for your injuries and damage to your Toyota Camry. Since many drivers have only the minimum liability required by law, it only takes a small accident to exceed their coverage. That’s why carrying high Uninsured/Underinsured Motorist coverage should not be overlooked. Comprehensive insurance coverage pays for damage caused by mother nature, theft, vandalism and other events. A deductible will apply and then insurance will cover the rest of the damage. Comprehensive coverage protects against things such as rock chips in glass, damage from getting keyed and hitting a deer. The maximum payout you can receive from a comprehensive claim is the market value of your vehicle, so if the vehicle’s value is low consider dropping full coverage. Liability insurance provides protection from injuries or damage you cause to a person or their property by causing an accident. It protects YOU from legal claims by others, and does not provide coverage for your injuries or vehicle damage. Liability coverage has three limits: bodily injury for each person, bodily injury for the entire accident, and a limit for property damage. You commonly see values of 100/300/100 that translate to a $100,000 limit per person for injuries, a limit of $300,000 in injury protection per accident, and property damage coverage for $100,000. Liability coverage pays for claims such as repair costs for stationary objects, funeral expenses, pain and suffering and emergency aid. How much liability coverage do you need? That is a personal decision, but it’s cheap coverage so purchase higher limits if possible. While you’re price shopping online, you should never sacrifice coverage to reduce premiums. There have been many cases where consumers will sacrifice full coverage only to discover later they didn’t have enough coverage. Your goal is to buy enough coverage for the lowest cost and still be able to protect your assets. More affordable car insurance is attainable online and with local insurance agents, and you should compare price quotes from both to have the best rate selection. Some companies may not have online quoting and most of the time these small insurance companies only sell through independent insurance agents.